Bob Schieffer is one of broadcast journalism’s most experienced Washington reporters. Schieffer retired on May 31, 2015, but returned to CBS News in January 2016 to contribute commentary segments through the 2017 Presidential inauguration. He was anchor and moderator of CBS News’ Face the Nation from May 1991 to June 2015, and served as the network’s Chief Washington Correspondent from 1982 to 2015. Schieffer covered the nation’s capital for 46 years and is one of the few journalists to have covered all four of the city’s major beats: the White House, the Pentagon, the State Department, and Capitol Hill. Schieffer covered every Presidential campaign during his tenure and was a floor reporter at every Democratic and Republican National Convention from 1972 until his retirement. He also moderated three presidential debates: those held in 2004, 2008, and 2012. Schieffer has won many broadcast news awards, including eight Emmys and two Sigma Delta Chi awards. In 2002, the National Press Foundation chose Schieffer as Broadcaster of the Year. That same year, he was inducted into the Broadcasting and Cable Hall of Fame, was chosen as the recipient of the Anti-Defamation League’s Hubert Humphrey First Amendment Award, and was selected as the Outstanding Journalist of the Year by the New York-based Respect for Law Alliance, Inc. The Library of Congress designated him a Living Legend in 2008. In 2013, Schieffer was inducted into the National Academy of Arts and Sciences Hall of Fame. Schieffer was a reporter at the Fort Worth Star-Telegram at the time of the assassination of President John F. Kennedy. In 1965, he became the first reporter from a metropolitan Texas newspaper to report from Vietnam. 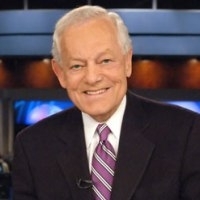 Schieffer later became a news anchor at WBAP-TV Dallas-Fort Worth, a post that eventually led to his joining CBS News. He received a B. A. in journalism and English from Texas Christian University and is an Air Force veteran. He says his greatest honor was when the Board of Trustees at his alma mater named the Bob Schieffer College of Communication. Schieffer is the author of four books, including the memoir This Just In: What I Couldn’t Tell You on TV, a New York Times bestseller published in 2003.